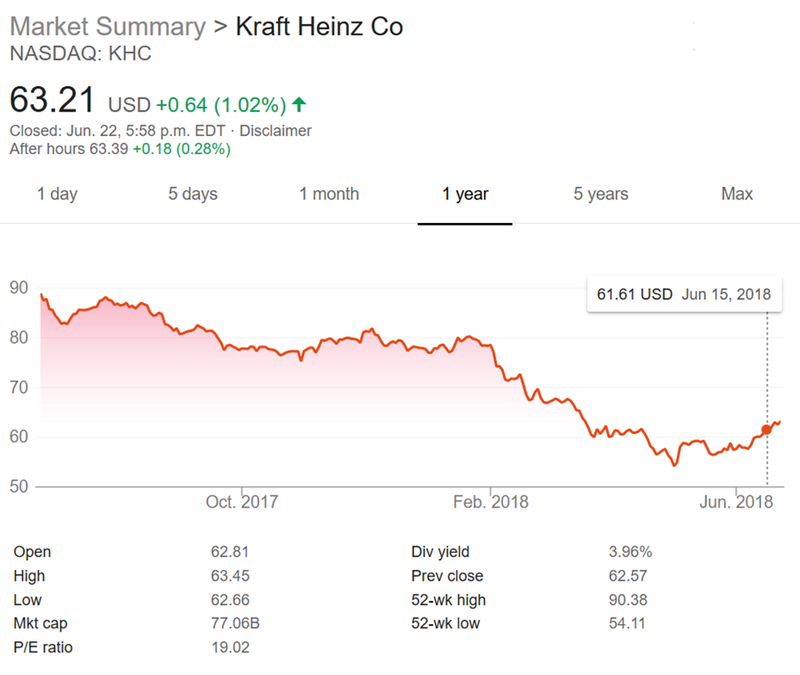 Kraft Heinz Analysis Notes June 2018 - Would you like some Ketchup on your Kraft Dinner? When you hear the word ketchup you likely think “Heinz” and when you think of macaroni and cheese you’ve probably got Kraft Dinner in your mind and flashbacks to childhood. Thanks to Warren Buffett, of Berkshire Hathaway fame, and 3G (the sometimes unloved “efficiency-oriented” managers) have put these two companies together. The idea was simple – Step 1) Buy Heinz in 2013, Step 2) make it more efficient through scaling input purchases and consolidating plants, and turn it into an acquisition vehicle, 3) buy more brands to get more scale, lower cost more, and take bought brands to new places, 4) rinse and repeat. Things seem to be ticking along OK, especially with the acquisition of Kraft in 2015. Although the synergies and such seem reasonable, it has left it with an awkward structure with two head offices. When WB and 3G bought Heinz in 2013 for $23 billion they promised they would keep the head office in Pittsburgh, the Company’s hometown. Then they bought Kraft for $46 billion or so, a much larger Company based in Chicago, and here we are today. But that’s a sidenote. The real challenge is that the Mr. Market is just not happy with how things are going. Although initially the stock continued to climb it has recently dropped from ~$94 to $54.11, with a recent recovery to the $63ish range. What's going on with the stock? · One issue is that it is just simply extremely hard to grow consumer staples brands and immediate growth hasn't materialized so they are now out of favour. There is a lot of pressure from competitors, a push by large chains to move towards private labels, and other issues leading to the moat not quite being as good as it used to be. ·Noise – lot’s of it. The Company has gone through a massive restructuring over the past few years, they are trimming/”renovating brands”, and sprinkle in things like significant tax changes, and you have quite the murky picture. The table below shows how noisy things have been. Here’s the cost breakdown of the restructuring they have gone through as well as the impact of the U.S. tax code changes. 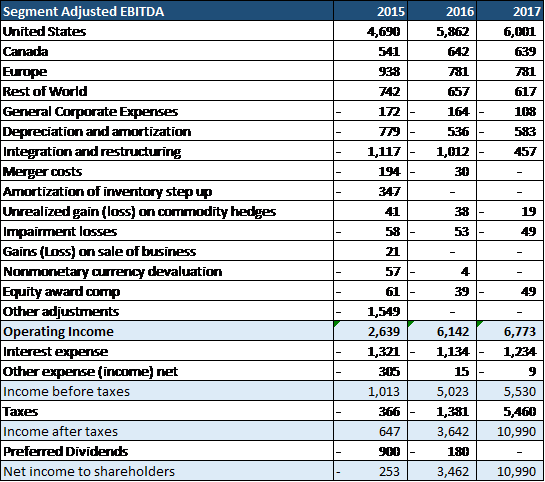 As a side note – It’s interesting to see how the recent tax reforms have impacted the Company. The table below is from their 2017 annual report. 1) Capacity to take pain as Thomas Russo says (see our article about his 2017 Value Investing talk) and capital diligence. Being backed by 3G and Berkshire Hathaway and most of the management team being from 3G will allow the Company to take short-term pain for long-term gain. This is evidenced by a $2.1 billion dollar restructuring reorganization of the combined company (which led to 4,900 redundancies for those keeping count), brand adjustments and wind downs. Currently Berkshire owns 26.7% while 3G owns 23.8%, making them the two largest shareholders with effective control. The third largest shareholder is 3.7%. 2) Strong brands and significant economies of scale combined with 3G’s management. Their efforts seem to be showing some fruit with improved EBITDA margins in both the U.S. (70% of sales) and Canada. It will be worth watching closely how they continue to adjust their brands and those strategies in Europe and the Rest of the World. Although 3G is known for cost cutting, in this case it is not just about costs. They are focusing on Renovating Brands and White Space initiatives. “Beginning with our strategic plan work in 2016, we identified 3 global brands, 5 global platforms and foodservice as our biggest opportunities. Currently, these 3 brands and 5 platforms represent about 2/3 of our retail sales. What does cash flow look like anyway? We put together the following simplified summary table outlining how cash flow looks over the last few years. The Base Case cash flow really is a “base” scenario, in that per share cash flow has a few tail winds behind it, namely 1) settling in of restructuring (like a factory hitting its stride once it’s worked out the kinks of the line), 2) the Company’s continued brand initiatives providing fruit, 3) continued share repurchases (303,048 in Q1), and 4) incremental value through further mergers (in Q1 they bought Cerebos Pacific Limited of Australia/New Zealand in Q1 for $238M). It's an interesting company at an interesting time and we will continue to look at it. It can’t be ignored though that this business is getting harder, not easier, over time.